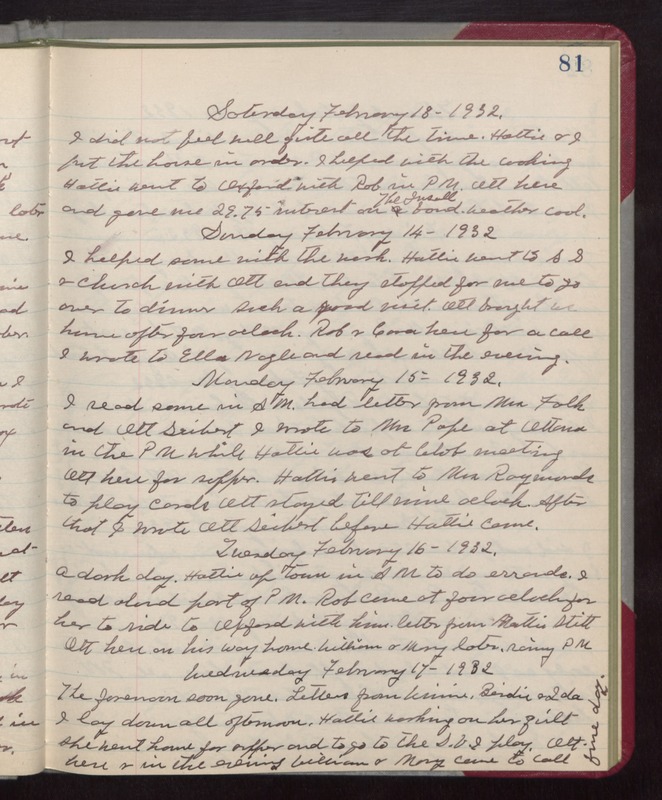 Saturday, February 13- 1932 I did not feel well quite all the time. Hattie & I put the house in order. I helped with the cooking. Hattie went to Oxford with Rob in PM. Ott here and gave me 29.75 interest on The [Insall] bond. Weather cool. Sunday February 14- 1932 I helped some with the wash. Hattie went to SS & Church with Ott and they stopped for me to go over dinner Such a good visit. Ott brought us home after four oclock. Rob & Cora here for a call I wrote to Ella Nagle and read in the evening. Monday February 15- 1932. I read some in AM. had letter from Mrs Falk and Ott Seibert I wrote to Mrs Pope at Ottawa in the PM while Hattie was at Club meeting Ott here for supper. Hattie went to Mrs Raymonds to play cards Ott stayed till nine oclock. After that I wrote Ott Seibert before Hattie came. Tuesday February 16- 1932. A dark day. Hattie up town in AM to do errands. I read aloud part of PM. Rob came at four oclock for her to ride to Oxford with him. letter from Mattie Stitt Ott here on his way home. William & Mary later. rainy PM Wednesday February 17- 1932 The forenoon soon gone. Letters from Winnie, Birdie & Ida I lay down all afternoon. Hattie working on her quilt She went home for supper and to go to the S.V.I play. Ott here & in the evening William & Mary came to call fine day.